Every day, hundreds of our migrant brothers face the difficult realities of deportation and arrive at an unknown city with an uncertain future. 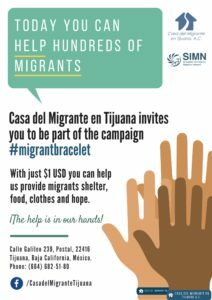 With your financial or material donation, Casa del Migrante en Tijuana can continue to provide support and hope to more than 9 thousand migrants who arrive at the shelter each year. Get organized with your family, friends or community and follow our social networks, or contact us to learn more about our needs. Collaborate as a volunteer in the different Casas del Migrante for a period of 3 or more months. You will be able gain unique experiences helping and serving migrants and refugees in Tijuana, Nuevo Laredo or Tecun Uman in Guatemala. 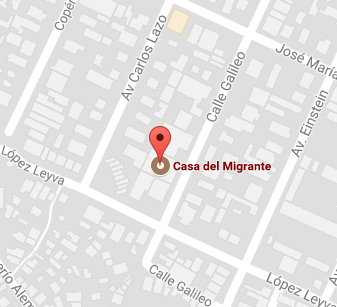 Casa del Migrante en Tijuana has many resources that you can share with your friends through social networks. Invite them to “follow” our Facebook and web page so they can stay informed about current migratory issues and our mission. Every time you share our information, you support our mission to reach more people and continue working. THANK YOU! As a Catholic community, we know that spiritual support through prayer is another way to help the most unfortunate. We unite to illuminate the path of hundreds of migrants and touch their hearts to ease their pain, fear and loneliness in their journey. Casa del Migrante en Tijuana undertakes different campaigns and activities to promote awareness in the community of the realities of migration. Follow our social networks to find out about our events, raffles and conferences, so that you can join in, and be sure to invite your friends.